John S. Hittell. : Surf Riding at Hilo, 1882. A. L. Bancroft & Co., San Francisco,1882. 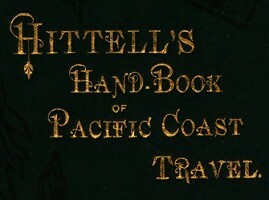 A. L. Bancroft & Co., San Francisco,1885. Hawaii.—Hilo, the principal town in this island, and the rainiest town in the group. The steamers Likelike, Lehua and Mokolii sail every week from Honolulu for Maui, Hawaii, Molokai, and the windward ports of Oahu. The trip from Honolulu to Hilo occupies about 40 hours, and the fare is $12.50. On the return trip, the steamer makes the circuit of the island each alternate week, calling at several points of interest on the way. For this there is an additional charge of $12.50. Kaawaloa, in Kealakakua Bay, is one of the calling places most frequented. It is but a collection of native huts, but a stone obelisk, 30 feet in height, and shaded with cocoa palms, marks the place where Cook was killed. The inscription on the monument reads: "In memory of the great circumnavigator, Captain Cook, B. N., who discovered these islands on the 18th of January, A. D. 1778, and fell near this spot, on the 14th day of February, A. D. 1779. This monument was erected in November, A. D. 1874, by some of his fellow-countrymen." Surf-board is one of the favorite sports at Hilo. On a rough day, when a heavy sea is rolling, a party of natives, each with his pape-he-nala (a tough plank, 6 to 10 feet long, and 2 feet wide), swim out to the first line of breakers, and watching their chance, dive underneath, and are carried by the undertow into the smooth water beyond. Here they remain until some huge roller gives them the chance they seek, when they place themselves in front of it, lying face downwards on the board. The wave speeds on, and its base soon strikes the ground, while the top curls over, and propels the swimmer before it with the speed of an express train, until he is landed high and dry on the shore. A short distance from the town is a small lagoon, where beautiful specimens of coral may be obtained, and on the rocks, near by, are cowrie shells. Opposite the lagoon is Cocoanut Island. There is no pleasanter spot for a picnic in all Hawaii. Geoff Cater (2017) : John S. Hittell : Surfriding at Hilo, 1882.